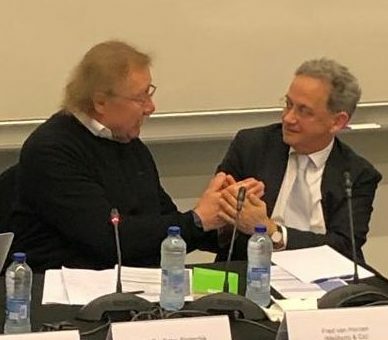 On 21 March 2019, the Amsterdam Center for Tax Law (ACTL) hosted a tax conference with and about Peter Sloterdijk, a leading philosopher from Germany. The event was chaired by Dutch Advocate-General Peter Wattel, and featured a wide selection of thinkers and writers, academics and also a priest, who gave an extremely interesting talk on Catholic Social Teaching in relation to Tax Justice. A run of the mill fiscal lineup, this was not. On the agenda was Sloterdijk’s Die nehmende Hand und die gebende Seite (subtitle: Beiträge zu der Debatte über die demokratische Neubegründung von Steuern). In this short text, Sloterdijk sets out a plan/thought experiment for replacing (mandatory) taxation with (voluntary) gifts. The idea is that this shift in the fiscal paradigm will lead to a different, more healthy, relationship between citizens and the State. Citizens would no longer be treated like “cash machines” for “kleptocratic States”. Under the gift approach, they would have a right to something in return for their generosity. This is meant to restore the dignity of citizens. The Sloterdijk proposal is timely, given the continued populist backlash against democratic institutions. Restoring trust is important. Philosophy can show us how or, as the case may be, how not. The organizers – Fred van Horzen and Paul de Haan, who have in the past contributed to Artikel104.nl – had kindly invited me to donate my tuppence worth on this challenging topic (see here for my slides, incl. some alternative proposals for increasing trust in society – a proletarian revolution not being one of them). An opportunity not to be missed! (I mean the invite, not necessarily the slides). My view was (and basically remains) that voluntary taxes could be fun as an add-on to the regular, mandatory tax assessment (like adding a tip at the end of a credit card bill), but that they are no substitute for actual, democratically designed and mandatory taxes, which apply to rich and poor alike. Aside from the question of whether the gift model could ever raise enough revenue (something which I very much doubt), a system based on gifts will – in all likelihood – give more power and influence to the wealthy, undermining the ‘one man, one vote’ principle which is so important for democratic decision making. This is most obvious if the citizens have the option of earmarking their gifts (“I will give money for hospitals, but not for prisons, solar energy or the servicing of the national debt”). But even if the gifts were to disappear into the anonymity of the national treasure chest, the size of the contributions clearly matters from a power-perspective. Not every billionaire is as enlightened as Bill and Melinda Gates, and the impact of a gift-strike by the 1% would -tax avoidance aside – have more impact than a strike by us lesser mortals (cf. Atlas Shrugged, A. Rand, 1957). We need taxes to level the playing field in the public-political domain. Taxes are the necessary equalizer if my vote is to be as valid as that of my boss; something which I would consider preferable, even though our economic positions are very different. Philanthropy is no alternative for taxes (although we can obviously have a discussion on the size of the State). I agree. Voluntary tax would also add stress. Problems in society are then increasingly the taxpayers problems. By paying voluntary taxes or not they have to support policies or not without knowing if the policy works or not. This gives extra (choice)stress. No, the current taxpayer can feel himself blessed by being able to be a critical citizen and voter.